The survey completed immediately after she was flipped made clear that the 1953 Shepherd Sportsman 110-S’s knee and forward keel had seen much better days. Could it be repaired using TotalBoat Thixo two-part epoxy? Possibly, but then I put a wrench on one of the carriage bolts – all of which were beyond suspect and must be replaced. The nut moved, but so did the entire bolt. And as it turned, the head, the sides of which were ground flat, split what was left. In this clip, John takes you through the process. Using one of our Fein Multimasters, John carefully excised the damaged material in preparation for executing another of his remarkable Dutchman repairs. Why not just tear all the planking away and replace all of it with new wood? We strive towards preservation over “restoration,” a major component of which is replacing only that which cannot be repaired. As is clear in the clip, repair is readily available and a sound choice for addressing this issue. We would replace only that wood which we cannot save. 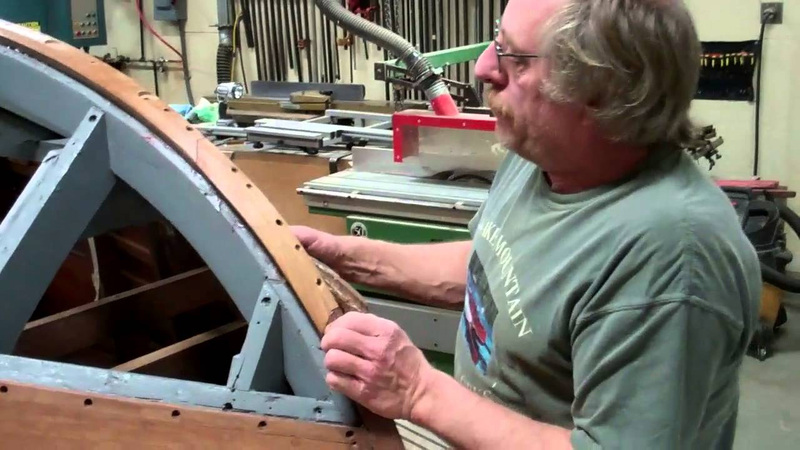 John shaped the replacement sections, refining the profile and sanding the adjoining faces in using a combination of hand-held and horizontal belt sanders. Here is the result … so much better than trying to “save” these parts using epoxy forced into the splits. Reinstalling the framework is next, so fabricating and installing the first layer of the new True 5200 Bottom is not far away ….